There are many instances in life that are worth being ready for, and there's nothing worse than missing out, and seeing all the fun that's being had without you! Pro surfer Felicity Palmateer has teamed up with Braun to give girls a glimpse of one of her hair removal secrets so you're always prepared – the Braun Silk-epil 9 SkinSpa. The Silk-épil 9 SkinSpa is Braun's fastest and most precise epilator to date*, bringing together two treatments: a new exfoliation brush and state-of-the-art epilation to provide the ultimate beauty solution for gorgeous non-stop smooth skin. It helps young women to achieve beautifully smooth skin consistently - no concerns over those in between days! Pro surfer and Braun Ambassador, Felicity Palmateer, knows better than anyone the need to banish those in-between days and achieve beautifully smooth skin from head to toe. The WA athlete is one of Australia's biggest lifestyle influencers, travelling the world, and inspiring girls to reach their full potential, so feeling on top of her daily beauty routine is essential. "Unwanted hair can really impact your confidence, stopping you from feeling and performing at your best. Whether I'm surfing for fun, tackling giant waves on the world tour, or just hitting the beach in my bikini with friends, the Braun Silk-épil 9 SkinSpa allows me to feel in control and ready for anything life throws at me!" 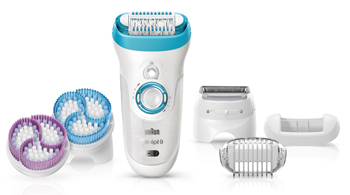 The Braun Silk-épil 9 SkinSpa is available from the Shaver Shop and priced from $299. For more information on the Braun portfolio, please visit Braun at www.braun.com. Question: Why did you choose to team up with Braun? Felicity Palmateer: Having beautiful, silky smooth skin makes you feel good about yourself from the moment you wake up and Braun's beauty range helps women achieve this confidence. When the opportunity came up, it was a no brainer! Question: How does unwanted hair affect your confidence? Felicity Palmateer: Being a professional surfer and model for Billabong, unwanted hair can really impact your confidence, stopping you from feeling and performing at your best. I've always used razors but I was pretty excited to start using the Braun Silk-epil 9 Skin Spa. Question: When do you first begin using an epilator? Felicity Palmateer: I've always used razors up until this new partnership with Braun. So I've only been using the Braun Silk-epil 9 Skin Spa for about 3-4 months and I really love it! I think it's great for any young girl starting to think about hair removal and is a great alternative to shaving or waxing. Question: What do you love about the Braun Silk-epil 9 SkinSpa? Felicity Palmateer: Being a surfer most of the time I'm in a bikini so I don't want to be worrying about unwanted hair so one of my favourite things about the Braun Silk-epil 9 Skin Spa is that it banishes those in between days and the result after is smoother than shaving and it lasts longer. So I don't need to worry about missing fun surf or a beach day with friends! Question: What are your top beauty tips, so you never miss out? Felicity Palmateer: Make sure you have the beauty tools to feel as confident as you can, so you never miss an occasion - my choice is the Braun Silk-epil 9 Skin Spa so I can achieve beautifully soft skin from head to toe. Question: What would we find in your beach bag? Snacks - Aussie Bodies low carb protein bar, a mango and some strawberries & blueberries! Felicity Palmateer: First thing I do is grab a coffee and go and check the waves at Burleigh Point which is close to where I live. If the surf is good I'll surf if not I'll swim. After that I usually will have breakfast that will either be a smoothie or eggs and avocado with greens. Then I'll do some emails or any little jobs I've needed to catch up. I also try to train at least once a day so that will be with my trainer in the gym doing strength and conditioning or a run or yoga. Question: What inspired your love of surfing? Felicity Palmateer: My dad taught me to surf so it was him that gets the credit. I fell in love with it when I was six years old. I still remember my first wave and the feeling. I have so many good memories from surfing and have been very fortunate to travel the world and meet some amazing people and have been to some amazing destinations. Question: How do you look after yourself, when you travel so much? What's next, for you? Felicity Palmateer: Travelling can definitely take its toll on you. Especially if you travel as much as me. I just try to take a few things everywhere with me so that I can recreate the same routine where ever I am. I always take running shoes where ever I go, I love to see all the sites. On top of that I like to take time out to enjoy my fruit juices and protein supplements. But if living out of a suitcase is the only down fall to being a pro surfer then that's not really that bad at all! Right now I'm midway through competing in the Australian leg of the World Tour. I'll also be chasing big swells to get more experience surfing bigger waves and travelling with my sponsor Billabong - I'm off with them to the Maldives in a couple of weeks for a photoshoot. Then returning to Margaret River for the Drug Aware Pro and the trials event. Last year I won, but eventually went down to World Champ Tyler Wright in the main event. We'll see what happens this time round!